Pairings: Dhofar 302?, Dhofar 303?, Dhofar 305?, Dhofar 306?, Dhofar 307?, Dhofar 309?, Dhofar 310, Dhofar 311, Dhofar 730?, Dhofar 731? A brownish gray stone of 174g covered by fusion crust was found in the Dhofar region of Oman; classification and description (A.Greshake, Berlin): a feldspathic fragmental breccia consisting of clasts of various lithologies embedded into a devitrified fine-grained matrix; schlieren and vesicles are abundant; feldspar, An96.5-99.5; pyroxene, Fs21.9-46.2Wo3.0-41.4; olivine, Fa29.3-47.8; augites are more abundant than Ca-poor pyroxenes and often contain pigeonite exsolution lamellae; accessory phases are Fe-Ni metal, ilmenite, and Ti-Cr-rich spinel; crystalline fragments include large gabbroic anorthosites, high-Al highland basalts, microporphyritic impact melt breccias, dark fine-grained impact melt breccias, and large cataclastic feldspar; no regolith components, e.g., glass spherules, have been identified; low bulk concentrations of MgO and FeO reflect low abundance of mafic components, J.N.Grossman and J.Zipfel, Met. Bull. 85, MAPS, 2001, 36 (Suppl. ), p.A293. Reported, with chemical analysis, mineralogy, noble gas data, and study of shock effects, A.Greshake et al., MAPS, 2001, 36, p.459. 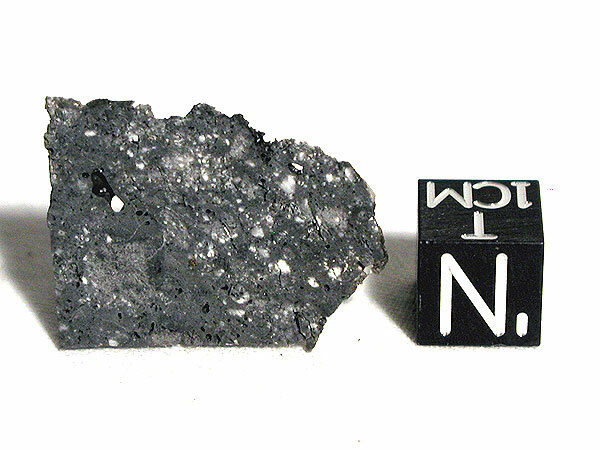 Noble gas data; depleted in solar type gases, Yu.A.Shukolyukov et al., LPSC, 2001, 32, abs. #1502. 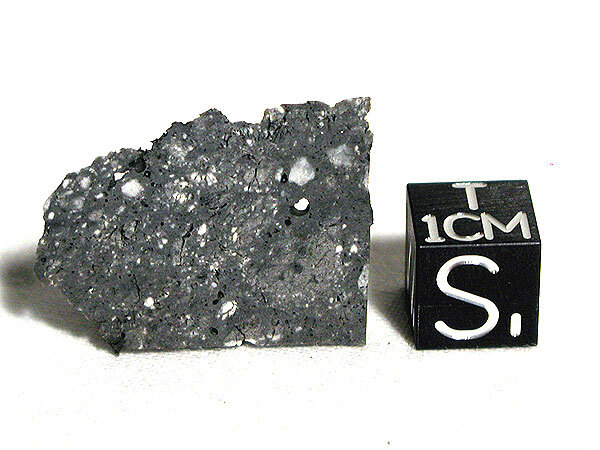 Bulk chemical composition; comparison with other lunar meteorites, P.H.Warren and L.A.Taylor, LPSC, 2001, 32, abs. #2197. CL study of exotic plagioclase fragments, A.Klaus and A.Bischoff, MAPS, 2001, 36, p.A93 (abs.). Cosmogenic radionuclide data, K.Nishiizumi and M.W.Caffee, MAPS, 2001, 36, p.A148 (abs). Mineralogy, petrography, and geochemistry, J.T.Cahill et al., LPSC, 2002, 33, abs. #1351. Trace element chemistry, M.A.Nazarov et al., LPSC, 2003, 34, abs. #1636. Petrogenesis, clast compositions, J.T.Cahill et al., MAPS, 2004, 39, p.503. REE abundances in clasts, G.J.Consolmagno et al., LPSC, 2004, 35, abs. #1370.